WooCommerce comes localization-ready out of the box. All that’s needed is a translation file for your language. The easiest method is to use a plugin called Loco Translate. More advanced users can use PoEdit. Both methods are covered in this doc. WordPress needs to be told which language it should run. Once this has been done, the shop displays in your locale if the language file exists. Otherwise, you need to create the language files (process explained below). We maintain translations at our project on GlotPress. If you want to contribute translated strings to your language or wish to start a new translation, register at WordPress.org and start translating. Translation is managed by teams over at translate.wordpress.org. Stable versions and development versions of WooCommerce are translated here, and anyone can contribute. When you install or update WooCommerce, WordPress will look for a 100% complete translation in your language and automatically download it. If there is no 100% complete translation you can download it manually, or we encourage you to contribute to get it to 100% so all users can benefit. If you’re new to translating, checkout the translators handbook to get started. 1/ Go to https://translate.wordpress.org/projects/wp-plugins/woocommerce and look for your language in the list. 2/ Click the title to be taken to the section for that language. 3/ Click the heading under Set/Sub Project to view and download a Stable version. 4/ Scroll to the bottom for export options. Export a .mo file for use on your site. 5/ Rename this file to woocommerce-YOURLANG.mo (e.g., Great Britain English should be en_GB). 6/ Upload to your site under wp-content/languages/woocommerce/. Once uploaded, this translation file may be used. WooCommerce includes a language file (.pot file) that contains all of the English text. You can find this language file inside the plugin folder in woocommerce/i18n/languages/. 1/ Download the free plugin called Loco Translate from here. Or add directly from the WordPress administration via Plugins > Add New. 3/ Go to the new Loco Translate menu item created in your Dashboard with five sub-sections. Note that Loco Translate offers three different locations for your create the translating, the best choice is Custom if you are looking to have your own custom translating, you should avoid “Author” location since it’s inside the plugin and will be override on updates, there is also the “System” location that will be override by translations from translate.wordpress.org. Note that when a new version of WooCommerce is released and updated on your site, you need refresh the .po file to look for new strings. Use the “Sync” button to find any new string to start translating. PoEdit is a more advanced alternative to Loco Translate. Only advanced users or translators wishing to create a custom translation to WooCommerce should attempt this method. 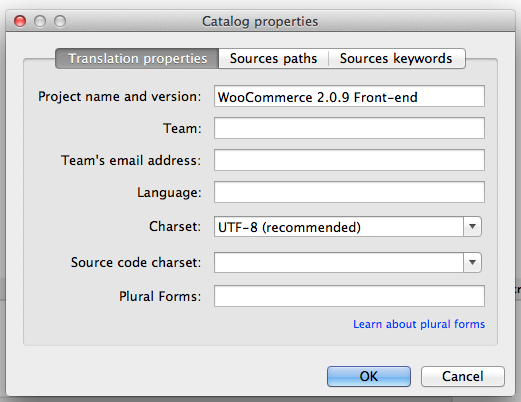 WooCommerce comes with a POT file that can be imported into PoEdit to translate. 1/ Open PoEdit and go to File > New catalog from POT file. 3/ Enter your name and details, so other translators know who you are, and click ‘OK‘. 4/ Save your .po file. 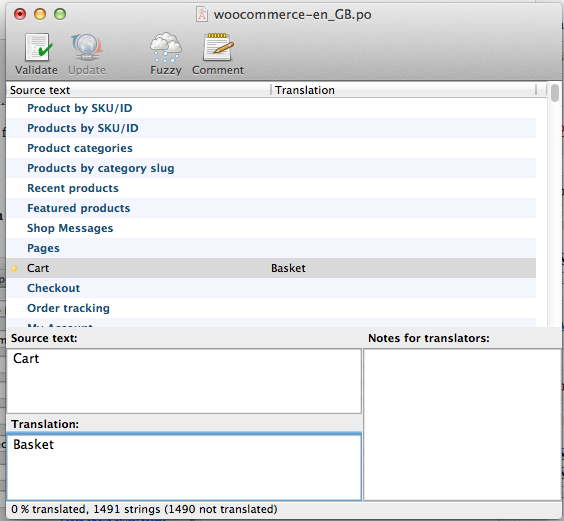 Name it based on what you are translating to, i.e., a GB translation is saved as woocommerce-en_GB.po . Now the strings are listed. 5/ Save after translating strings. The .mo file is generated automatically. 6/ Update your .po file by opening it and then go to Catalog > Update from POT file. 7/ Choose the file and it will be updated accordingly.